I'm having a really busy summer and have been having a lot of fun. I've been doing a lot of sewing and went to the Kokomo One Stop Shop Hop a couple of weeks ago with friends to do a little stash enhancement. I didn't take one single photo. My friend Michele picked up this row by row for me from a shop in Kentucky because she knows how much I love English Paper Piecing. I was just going to make this one row and quilt it, but I may rethink that and do a small quilt.. There are a lot of really cute rows out there. I always have fun at English Paper Piecing Addiction Group at Back Door Quilts. This Oh My Gosh quilt belongs to Marlene. She is even making a second one. It is just gorgeous. I've been doing a lot with DAR friends including sewing for our DAR fund raiser. One of the girls bought a lot (somewhere between 8 - 10 yards) of the red and white striped fabric you see in the photo below. She asked if I could make something out of it. So I made 16 placemats. There is red and white stripe on the back, too. Then I used the smaller pieces to make 36 travel tissue holders. They are all lined with red and white stripe. I made this little flag quilt earlier, and I backed it with the red and white stripe and made some napkins. And there was still some left......so I made a 10 minute table runner which takes a little longer than 10 minutes. I'm still working on finishing up some of my UFOs. These hexagons are for my Aunt Sarah quilt. The pattern was in Quiltmania Magazine #82. It looks like that issue was published in 2011. The hexagons are 3/4". There is a large oval center that is applique'd and looks a little like the center of the Auntie Greene quilt. I've made several "tries" at this quilt before. I have always liked the quilt but wasn't totally sold on the center. I think I have another idea of what to do there. If you go back to my post here, you will see the photo of the quilt from the magazine. 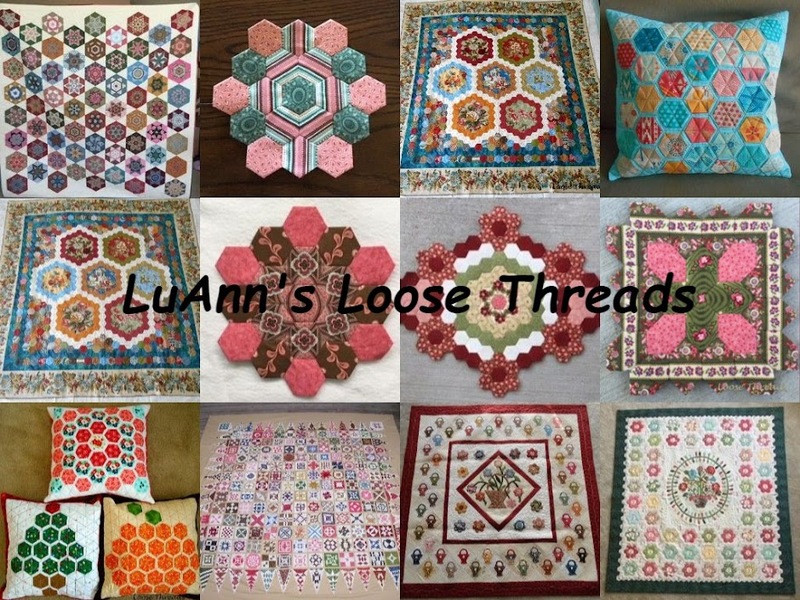 The two hexagons that I show in that post must have been used in another project because they weren't in the UFO bag with the quilt center. I'm still making pillows from my Charming Hexie Pillow pattern. The pattern is available in my Etsy shop here. You can also purchase the pattern at Back Door Quilts. I am enjoying choosing 39 hexagons and glue basting them. I will soon have enough pillows made that I may sell some in my Etsy shop. Stay tuned. I made this one as a present for my daughter. It's made from the same mini charm pack that I used to make the shop sample for Back Door. I've also spent some fun Grandma time. Here is Malcolm who is 5 months old. Daniel had a lot of fun at the Indianapolis Children's Museum. He really enjoyed the Hot Wheels exhibit. These two guys just make me smile. I still enjoy reading blogs, but I see the attraction to Instagram. It's easy and quick to just post a photo and a few words. But, for now, I'll keep writing as long as you are still stopping here to read my ramblings.